My 12-year-old daughter Eliza is somewhat of a PF Chang’s fanatic. To be honest, she will chow down on any type of Asian meal she can get her hands on, but lettuce wraps are her jam and according to her, PF Chang’s has the best. She relishes in the fact that she can order their meaty wraps and have the whole plate to herself. But chicken, gluten, and oyster sauce means a no-go for the rest of us. So when Kiersten challenged me to make a meatless version of lettuce wraps, I was both intrigued and a little terrified at the same time. Kiersten had no way of knowing that I live with a self-appointed lettuce wrap aficionado and when it comes to food I can always trust Eliza to give me honest feedback, even when it may be hard for me to hear. Armed with Eliza’s help, I anxiously accepted the challenge. I stalked the internet, I hung out in the ethnic section of Whole Foods far too long, and then I came home and made my first attempt at lettuce wraps. On the Eliza rating scale, they were a “kind of like” not a “love,” so I went back and started over, picking apart what she liked and didn’t like about my failed attempt. Have you ever tried to have a 12-year-old girl old explain why they like or don’t like something when it comes to food? I assure you, it requires patience and lots of love! *Ok, I may have a flair for the dramatic and that may be an embellishment, but it was a BIG deal! Over the course of the next 24 hours, Eliza had lettuce wraps for breakfast, packed in her lunch for school, as an afternoon snack, and again at dinner that night! She pouted when the filling ran out and made me promise that these will be making a regular appearance in our house and her lunchbox. There is more prep involved in this recipe than actual cooking. It is very important to have all of the ingredients prepared and ready to go before heating your pan. When you are chopping the ingredients for the filling, you want all of the pieces to be the same size. 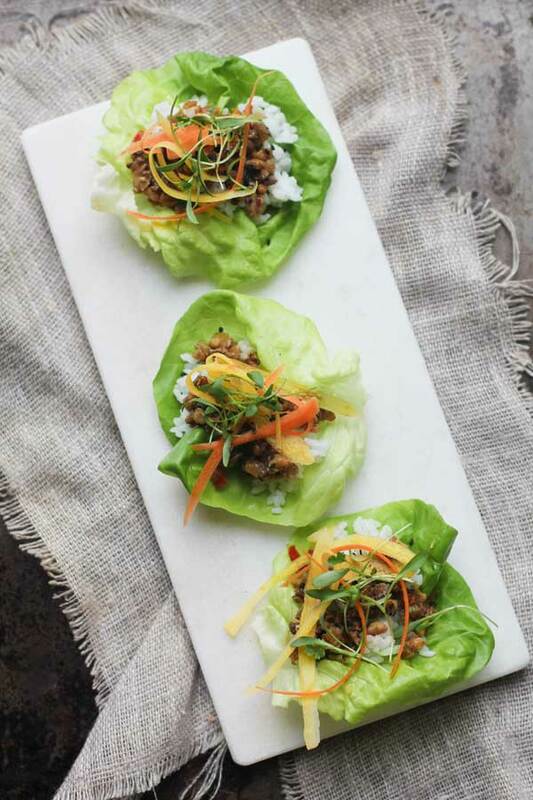 A bulky dice will only make your lettuce wraps hard to eat and instead of the flavors of the ingredients merging together, they will stand apart from one another. I discarded the stem and gills from our portabella mushroom so that the intense earthy flavor that the gills lend was not overpowering the rest of the ingredients. This step is completely optional and up to you. If you are a sauce fanatic, go ahead and make a double batch of my hoisin sauce because according to my daughter, extra sauce is essential! 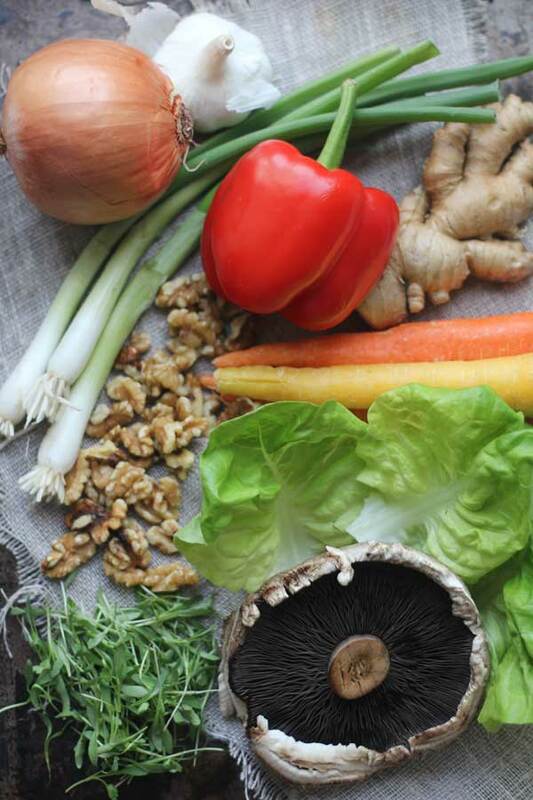 These vegetarian lettuce wraps replace the meat with walnuts and portabella mushrooms. Combine all of the sauce ingredients in a food processor fitted with the S-blade or a high-powered blender. Process until all of the ingredients are combined, but the sauce still has visible chunks of peanut in it. Set aside. Heat the olive oil in a large heavy-bottomed skillet over medium-high heat until shimmering. Add the onion, bell pepper, and mushroom to the pan; stir to combine and spread the filling out in an even layer so the veggies sauté instead of steam. Cook for 7-8 minutes, stirring once or twice and spreading the filling back out evenly each time. Add the minced ginger and hoisin sauce; stir to combine and cook for 1 minute longer. Stir in the water chestnuts, green onions, and raw walnuts to the pan and cook until the green onions begin to wilt, about 1 minute. Remove from the heat. Layer lettuce leaves with sushi rice (if using), a heaping spoon full of filling and top with carrot ribbons, cilantro, and a sprinkle of sesame seeds. If you are preparing the optional sushi rice for this meal 1 cup of uncooked rice will cook up to approximately 2 1/2 cups of cooked rice. Since I cook gluten-free for my family, I used a homemade hoisin sauce; a store-bought sauce should work too, but I haven’t tested it myself. So do you actually have a gluten allergy, or are you just doing it because “gluten free” is the latest fad? Meg’s son has a gluten allergy, so she chooses to cook gluten-free in her household. Just because people jump on the gluten-free fad doesn’t mean that everyone who eats gluten-free has no reason to do so. I just made this recipe tonight for my family and it is absolutely delicious! There are NO leftovers. I did substitute Agave Nectar for the honey. I tasted the sauce and it was bit too salty for my taste, so I added more Agave Nectar, rice wine vinegar and Siracha sauce until it tasted more balanced. I did not have the gluten free varieties so there was probably more sodium in my ingredients. Kudos to you and your daughter for creating such a delicious recipe. My husband said that it tasted like we were eating at P. F. Chang’s, which is the ultimate compliment. Thanks for sharing. We made this last night and it was absolutely amazing! Thank you!! Made this last night!! It was FANTASTIC!! This is now a go to recipe!!! Hey I was curious, it says 4 servings, but what is a serving? one lettuce wrap per serving? I am using this for a school project. It depends on the size of the lettuce leaves you use – the filling serves about 4 people, but bigger lettuce leaves will mean you have fewer wraps and smaller lettuce leaves means you’ll have more. I made these tonight and everyone loved them. I did use store bought hoisin and it was good, but I really want to try your sauce. Thanks for the wonderful recipe. -and a small splash of pomegranate reduction actually worked quite well to round out the sweetness in the sauce from the honey (I used manuka, which isn’t as sweet as some). My biggest tweak, though, was to add roughly 1 tablespoon of chili powder to vegetable mixture. Togarishi or Chinese Five Spice would probably work very well, too. I made a double batch and withheld the garlic from half of the mixture so I can freeze it (will just add it after defrosting for a quick wok dinner some night 🙂 Thanks again!! I tried the hoisin sauce today – the flavor was amazing but way salty. and it makes very little. i will def do this hoisin sauce again but will find a way to ease up on the saltiness and at least double the sauce. VERY yummy – great flavor. Making these for the third time tonight, ( made on different nights) and they are AWESOME! Great recipe and gluten free ! Yay thank you. So delicious! I made with brown sugar instead of honey, vermicilli instead of rice and cold cucumber, tomato and coriander as the filling. I didn’t know what sriracha was and was too hungry to google so I used two shakes of Chinese 5spice and added 1.5tbl spoons of Kaitaia Fire for heat. Best recipe ever so thanks for all your road testing! Oh this is so delicious!! I just made this for lunch today. My fiance and I ate the whole batch. I did not have miso (I omitted completely) and I had to sub toasted sunflower seeds for the sesame seeds. Still turned out absolutely fabulous! Thank you!! Very yummy! Substituted celery since I had no water chestnuts. Will make again but will probably double everything as we had no leftovers. To lower the fat, I did not add any of the oil – just sauteed in water and skipped the sesame oil.